Almost every small and medium-sized town has what are called farmers markets. We love them. Some are seasonal. Some open only on weekends. People shops under tents and pay vendors cash. It’s all very charming, a nice alternative to superstores. I just returned from one. I came home with a 4-pound Red Snapper, oversized Brussels Sprouts, beautiful red potatoes, fresh cheese made in the Mexican style, and tubs of spices – all for less than half what I would pay at a regular grocery store. Plus I enjoyed looking at foods and ingredients from all over the world. So delightful, and so smart financially. You simply would not believe the fish counter. You would think it was Greece or Turkey. However, there were no tents and no farmers taking cash. This was a permanent building with regular hours of operation, unified checkout lines, and all the necessary technology to take credit cards. Enough of the products there were direct-to-consumer to justify the name ‘farmers market’ but it’s also a big business. You simply would not believe the fish counter. You would think it was Greece or Turkey. Fresh fish (yes, with heads and tails) were everywhere, on ice, all selling for half the price of the frozen stuff at the local store. It was dazzling. And the action! People from all over the world were grabbing tickets (you had to get in line), shouting demands, and piling their carts high. It was just beautiful, if you like this sort of thing, which I do. Still, there is something puzzling about these markets. I have friends who visit or move from foreign countries. I’ve always been proud of American food markets, but these typically denounce what they find in stores. They think our food is terrible: processed, fake, tasteless, boring, expensive. Every bit of food sold in the US is subject to regulation. For this reason, my friends from Turkey, Israel, and Brazil dread going to the store. They scour through our supermarkets in disgust, and can’t understand why we have it so bad – and that we don’t even know it. And they blame our food system for dreadful US health problems and obesity. Then these people finally discover the out-of-the way farmers markets and come back saying: ok this what food is supposed to be, more or less. But these markets are not mainstream and not entirely accessible. You have to drive the drive and deal with many other inconveniences. I became curious why this huge wall separates regular grocery stores from farmers markets. There is surely more than marketing going on here. Why Do Farmers Markets Exist? What is a farmers market anyway? People think of it as a place where producers sell directly to the consumer without the middleman of the wholesaler. That explains the lower prices. 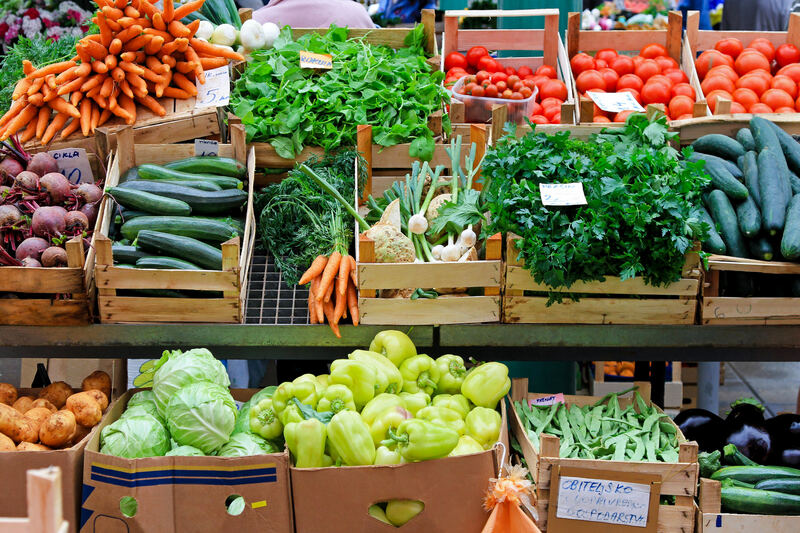 A farmers market is a public and recurring assembly of farmers or their representatives selling the food that they produced directly to consumers. Farmers markets facilitate personal connections and bonds of mutual benefits between farmers, shoppers, and communities. By cutting out middlemen, farmers receive more of our food dollars and shoppers receive the freshest and most flavorful food in their area and local economies prosper. That’s all fine, but it raises the question: why do normal grocery stores not carry the same products as farmers markets? You could observe that it is because the groceries are controlled by food cartels, and there is a certain truth in that. That’s what gives you the feeling of getting such an incredible deal at farmers markets. Still, that alone doesn’t quite explain why we have such a strict distinction in the US between grocery stores and farmers markets. This is not just a different method of getting food to the consumer. There is more going on. As usual, it comes down to government. In this case, it is all about the regulatory thicket that food has to get through to get to the consumer. Every bit of food sold in the US is subject to regulation. But farmers markets, in particular, are subject to far less. Why? Part of it comes down to embedded tradition. When the lady at the local Methodist church makes jam, as her mother did and her mother’s mother did, she should be able to sell that to raise money for the congregation. Everyone knows that. If the federal government sent in the food police, the headlines would be egregious. Expand that model out and you basically have the structure of the farmers market. It lives and thrives in relative immunity from the labyrinth of federal regulations that are imposed on conventional stores that depend on broad structures of wholesale distribution. The regulations are almost always about food safety, the very earliest and most comprehensive form of government regulation to come to the US. For farmers who sell fresh fruits and vegetables at farmers markets, food safety will be business as usual, despite the federal Food and Drug Administration’s new proposed rules governing produce. “Business as usual,” because most market farmers are exempt from the new rules, just as they’re exempt from the Food Safety Modernization Act, which was signed into law in 2010. Now the protectionism takes the form of egregious and incomprehensible safety regulations. As the regulatory thicket has grown, so have farmers markets that are seeking relief, from 2,000 nationwide in 1994 to 8,000 in 2014, according to the Department of Agriculture. It’s true that tastes have changed, and many people are looking for fresher, locally grown produce and more exotic ingredients that grocery stores don’t typically provide. That said, the relative absence of federal regulation over farmers markets is also a main factor in their growth. “Unlike fruits and vegetables grown and sold to your local grocery stores, fruits and veggies sold at farmers’ markets are often unregulated and even exempted from food safety regulations.,” points out SafeFruitsandVegitables. The relative lack of regulation accounts for not only the lower prices but the greater variety of produce, meats, and grains. And this also affects imports as well, which is why your grocery store has only these lame bottles for $5 whereas the farmers markets has a world of spices for a fraction of the price. The American Spice Trade Association tries to provide a comprehensive guide to the myriad restrictions on spice imports. What you quickly learn is that this is not about tariffs or quotas, the older methods of protectionism. Now the protectionism takes the form of egregious and incomprehensible safety regulations that foreign spice companies can’t possibly begin to get comply with. And this entirely explains why it is that when I was recently in Israel, I enjoyed looking through markets with huge burlap sacks of fragrant herbs and spices, sold for a small fraction of what you can get at the local grocery in the US. The contrast is startling, and foreigners notice this more than anyone else. The rest of us are used to paying $5 for a tiny bottle of ground cumin. Looking through my local farmers market, it seems obvious that not everything here is grown by local farmers, or caught by local fisherman. The place also had a huge aisle full of regular cereal, beer, wine, and even frozen pizza, same as Publix or Kroger. In other words, in many respects apart from having a wild variety of everything you can’t get at a regular grocery store, it has most everything you can. And why? Because there is nothing in the regulations that says that a farmers market can only carry producer-to-consumer products, only that to the extent it does, it has treated differently by federal regulations. Just imagine a world in which everything and everyone were exempt from regulatory control over food. That helps account for one reason that foreign peoples find our food so subpar. There are other factors of course. Sugar tariffs make sugar prohibitively expensive as compared with corn syrup. Then you add to that huge subsidies to corn, and you get the extremely strange situation in which vast amounts of American food are just varieties of corn. We have so much corn that we make our packing out of it. We fry everything in it. We sweeten all things with it. We put it in our gas tanks. The agricultural regulatory system is so locked down that it seems unreformable. Every line of the code has a passionate defender. Consumers who want freedom of choice, great quality, and low prices are powerless in the face of the regulatory/industrial machinery. The result is a gigantic mess that has the potential to become life-threatening. Just imagine a world in which everything and everyone were exempt from regulatory control over food. You could buy anything from anywhere, grow or make anything and get it to anyone who wants it for whatever price. Maybe even raw milk! We can manage what we eat–and there will be plenty of it!–so long as we are given information, choice, and a truly competitive marketplace. For your viewing pleasure, here is the fish counter at the market I visited.